The IRC range of thermal imaging cameras from Martindale Electric provide real time imaging with spot IR temperature measurement for a range of maintenance and diagnostic functions. A new range of IRC thermal imaging cameras from Martindale Electric represents a breakthrough in affordable thermal imaging for troubleshooting of electrical and mechanical installations. The combination of real time thermal imaging with spot infrared temperature measurement, packaged in a rugged pistol design, make it the ideal tool for electricians and maintenance teams needing fast on-site diagnostics. The cameras show hot and cold spots at a glance and accurately measure spot temperatures of hot and hard to reach surfaces. The advanced thermal images, displayed on the 4.5cm colour display, combine colour temperature gradients and component outlines to quickly troubleshoot problems, be it poor electrical connections, phase unbalance or faulty motors and bearings. Both IRC325 and IRC327 include an infrared spot thermometer making it easy to accurately and safely measure the temperature of hot and hard to reach surfaces without contact. For more advanced applications, the IRC327 has an extended temperature range to 650o C and allows simple capture and storage of the image to the SD card for evaluation and reporting. In addition, laser targeting and the 5 LED torch make it easy to get reliable measurements wherever you are working. The built-in lens cover of the IRC327 provides protection for all environments. The two models can be used for a wide range of applications from identifying sources of heat loss to reduce energy bills, through to checking the correct functioning of heating and ventilation systems. The point and shoot designs are easy to use and enable users to get up and running without the need to navigate complicated menus. The IRC327 allows simple setting of emissivity and choice of colour palettes for enhanced diagnostics. The IRC327 also includes a simple UV leak detector function which, for example, can be used to reliably detect leaks in cooling and air-conditioning systems when a suitable UV indicator dye is used. 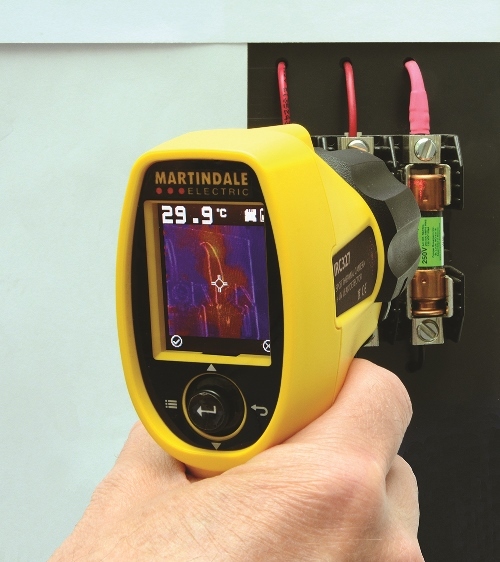 Featuring a lightweight pistol shape design for comfort and easy access to functions, the new range of thermal imaging cameras from Martindale offer an ideal and affordable solution for busy electricians and maintenance teams to troubleshoot problems quickly and identify potential maintenance issues early.